Buffalo, crocodile & plains game hunting. Unsurpassed plains game hunting in Eastern Cape. Highly trained and dedicated 15+ year veteran staff. Museum trained taxidermist for optimal trophy care. J.P. Kleinhans offers excellent concessions in the Eastern Cape and elsewhere in South Africa, offering a tremendous range of game. 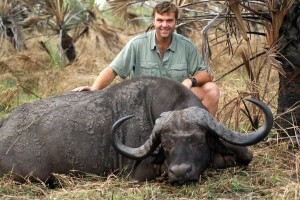 Africa has many extremely competent outfitters and professional hunters. J.P. is certainly among them, but few make it as much fun! If you like to laugh, you’ll love hunting with J.P. Kleinhans!